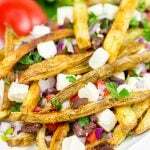 Looking for a tasty grilled appetizer? 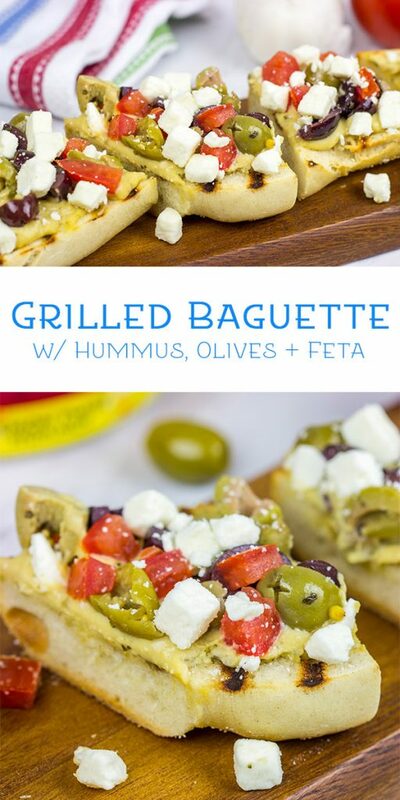 This Grilled Mediterranean Baguette is easy and delicious! Dinner time around our house has been a bit insane lately. At the end of the day, I run out and pick up Robbie from daycare. As soon as I walk in the door, the dogs start barking at me non-stop. I could be nice and say they’re excited to see Robbie again. But in truth they know that dinner comes shortly after Robbie gets home. So now I’ve got Robbie in his chair yabbering away non-stop and two dogs barking and racing all over the house. And this happens pretty much everyday between 5-6pm. Let’s just say it’s a welcome site when I see Laura pull into the driveway! On top of all that, Robbie has just started eating solid food. And man, that kid loves to eat! (He takes after his Dad like that…) We tried solid food (i.e. baby oatmeal) with him a couple of weeks ago, but he had an ear infection at the time. Let’s just say the solid food didn’t go over too well. Fast forward a couple of weeks, and now he is eating oatmeal like a champ. So by the time we’ve fed Robbie, cleaned him up and gotten him off to bed, we’re wiped out. And we often haven’t even started dinner for ourselves yet. That’s where easy dinners like this Grilled Mediterranean Baguette come in. 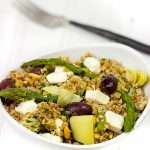 Truthfully, this one makes a great appetizer, but it’s totally been dinner for us a couple times this past week. I’m not complaining at all. This is one delicious meal, and it comes together quickly, too. In celebration of National Hummus Day (May 13th), I decided to whip up a fun appetizer. Grilling season is officially underway in our neck of the woods, so I knew I wanted to do something on the grill. While Laura was feeding Robbie his nightly oatmeal, I sliced a baguette length-wise and tossed it in the grill for a hot minute. (Literally.) 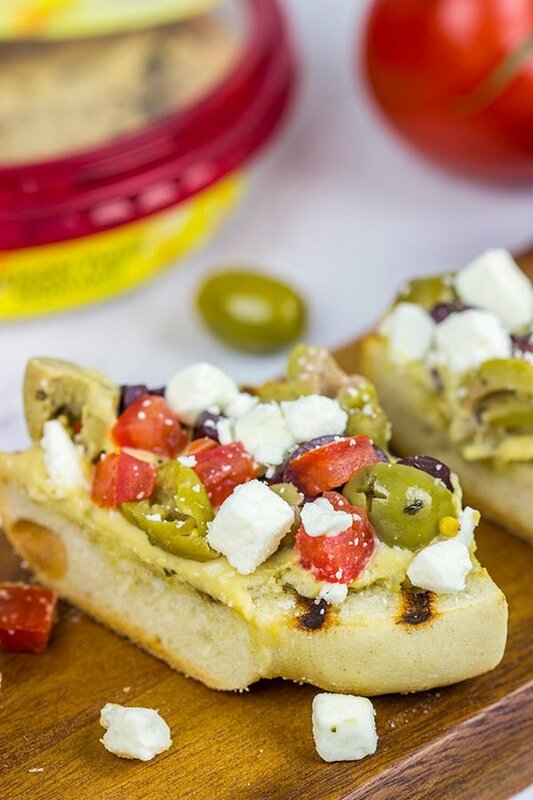 Back inside, I spread a bit of Lemon Twist Hummus on top of the grilled baguette, and then I topped that bad boy with chopped olives, tomatoes and feta. Appetizer done. Or in our case, dinner done! This Grilled Mediterranean Baguette was delicious. The combo of olives, tomatoes and feta is a no-brainer, but the real star was the Lemon Twist Hummus. 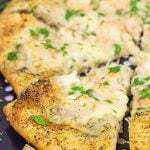 It provided a nice base for the toppings, and the light, lemony flavor was perfect with the Mediterranean-inspired toppings. 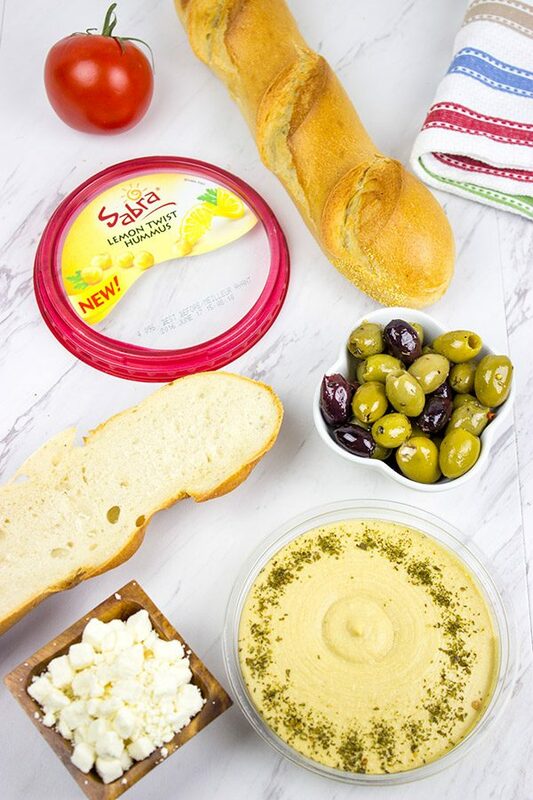 Pssst…to help celebrate National Hummus Day, Sabra has a coupon for $.55 or $2.00 when shared. Grab a coupon and get to celebrating! Cheers! Slice the loaf of bread in half horizontally to create two long pieces. Brush the cut side of each half of bread with ~1 Tbsp of olive oil. Spread the Lemon Twist Hummus on top of bread. 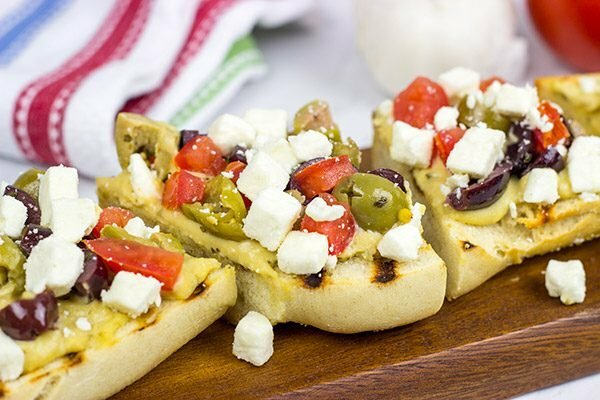 Top with chopped olives, tomatoes and feta cheese. Drizzle the top of the bread with the remaining olive oil. Tip: If your grocery store has an olive bar, that's an easy way to pick up just a handful of assorted olives. 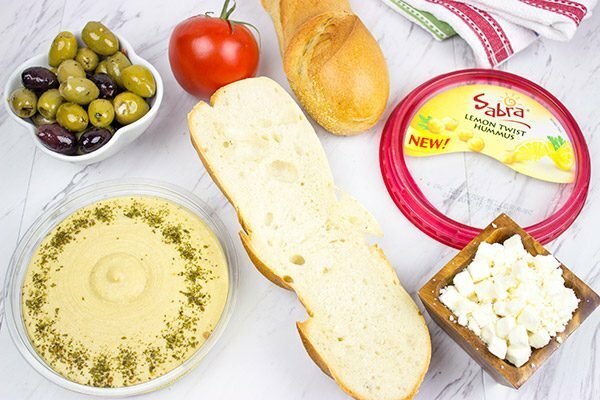 This Grilled Mediterranean Baguette post was sponsored by Sabra, but the recipe and opinions are entirely my own. National Hummus Day? Who would have thought? 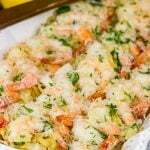 This recipe is my kinda weekend food (with a glass of wine, of course). Never thought of using hummus this way before, but looks delicious. Hope you guys get some rest and have a lovely weekend, David! We love eating hummus with pita chips, but we also love spending time outdoors. That’s when I realized that hummus on some grilled bread would be a fun appetizer. 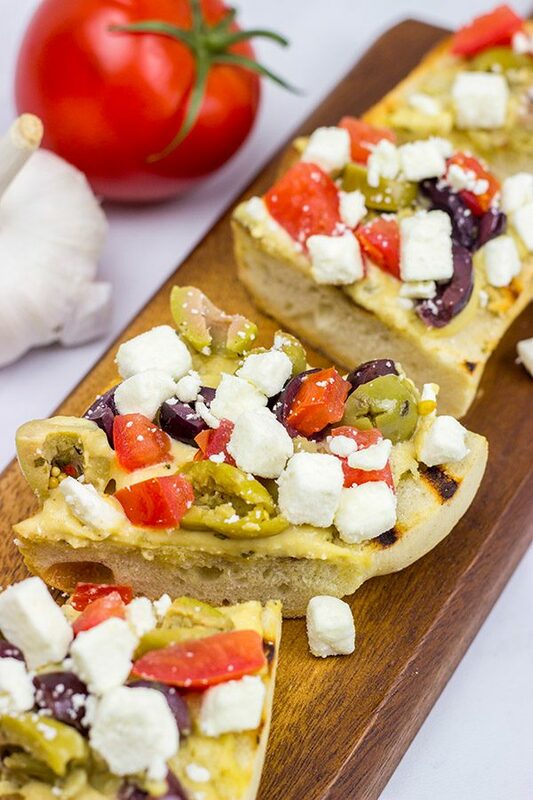 Here’s to delicious weekend appetizers…with a glass of wine (of course)! 🙂 Thanks, Dawn! Hi David! What a simple and impressive dinner! Right next to the Sabra hummus at my local store, they have containers of marinated mixed olives and feta which are really good! I am going to look for that caramelized onion and smoked paprika hummus next time I go to town! Have a fun filled weekend! Perfect! It’s like your local store just knew what you were thinking. 🙂 Grilled baguettes are a fun base for appetizers/light dinners. But keep an eye on ’em. I may or may not have made Blackened Grilled Bread in the past…and not ‘blackened’ in the good way. I hope you and Gary had a great weekend, Dorothy! Just call it “tapas,” and then it’s officially dinner, even if it is an appetizer. 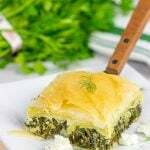 I love the Mediterranean flavors David, this looks so good! 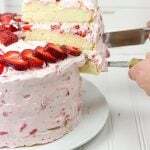 I can eat this for my lunch! We may or may not have eaten this for dinner one night and then again for lunch the next day. Hey, I had a leftover baguette…and it’s one easy meal! 🙂 Thanks so much, Manali! This looks like such a delicious recipe! And I’ve never seen that flavor of hummus before. 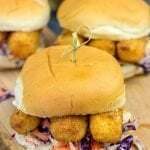 I love this as an appetizer or even a light lunch. Thank you so much for sharing! This is totally an acceptable dinner- I mean, it’s pretty much an adult style open sandwich. Mum often buys a baguette and eats it with Persian feta for dinner (the cheese is actually Bulgarian but shhh). That’s true! It’s just a grilled sandwich…served open-face. Open-face sandwiches were the best when we were kids! Oh, and that Persian feta. It’s pretty darn delicious! I’ll have to pick up some at the store today! This is my kind of dinner….the Mediterranean baguette…not the oatmeal! 🙂 Little Robbie is going to be helping cook dinner in no time at all! Yay for Robbie eating solid food and helping to feed himself! 🙂 I’m sure that keeps things interesting. This Mediterranean Baguette looks so good! And I could totally see myself eating this for dinner as well and not just as an appetizer. Haha, yeah. Robbie “feeding” himself certainly keeps things interesting. We started into squash this past weekend…so that means we were cleaning squash out of his hair. 🙂 Cheers to warm summer evenings and appetizers for dinner! Thanks so much, Tamara! Yay for Robbie moving onto solid food! When Lil Shashi was really little, she used to like to feed herself too – infact, she was downright obstinate about doing it – would refuse to eat sometimes, so, I would set a plastic tablecloth on the floor and sit her down (with only a diaper on) with her bowl of oats and good golly, there’d be oats in her hair, up her nose, all over that plastic tablecloth – but, she’d finish the whole thing and seemed to get so much joy from feeding herself – crazy kid eh?! Hope y’all had a wonderful weekend! Haha…I like the way you’re thinking, Shashi. We’ll do baguette night instead of pizza night! Seriously, though, that lemon hummus on a grilled baguette? Yum!